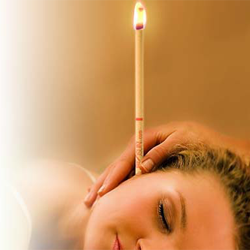 Ear Coning also known as Ear Candling: A non-invasive natural ear cleansing method used for centuries by the indigenous people of many continents.A hollow tapered candle (resembling a straw) made from beeswax and lined with 100% untreated cotton is placed in the ear and the other end is lit. While the candle is burning, the flame creates a vacuum which helps to remove wax, toxins, dust and fungus by drawing it gently up into the hollow cone. Hearing Loss or impairment due to a build-up of wax in the ear. It is also safe for young children and is known to prevent recurring ear infections. I offer treatments to clients in the Newmarket and surrounding areas. I also offer courses for those would like to become qualified to become Ear Coning practitioners. For more information on this course, please click here. To schedule an Ear Coning treatment or for more information on travel costs for in-person treatments, please contact me. If it is an emergency please contact me at (905) 392-1685.